A coastal beachside town in northern New South Wales, Byron Bay is one of the most popular places to visit for all travellers coming to Australia. Our Byron Bay accommodation is perfect for all visitors looking for a relaxed, comfortable place to stay in an exceptional location. The relaxed beach vibe and stunning sandy shores make Byron Bay a tourist hotspot in the warmer months. With something for everyone, you'll never be short of things to do in Byron Bay, it is no wonder the city has gained such a positive reputation. Byron Bay offers some of the best surfing conditions in Australia, with its scenic beaches and beautiful parklands resembling a heavenly playground for outdoor lovers. Home to a range of well-known festivals such as Splendour in the Grass, Byron Bay International Film Festival, Byron Bay Writers Festival and Falls Festival the city attracts a healthy crowd of keen festival enthusiasts. When there isn't a festival on, there are still plenty of things to do in Byron Bay including surfing, bush hikes, coastal walks and indulging in the spectacular restaurant scene. 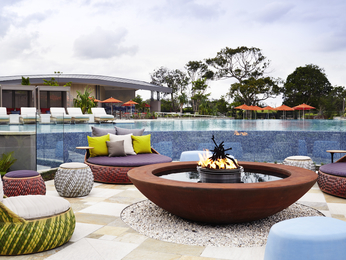 Feel welcome at Byron Bay hotels offered by AccorHotels and our partners. Discover our selection of luxury to budget hotels and Byron Bay resorts on offer. Your next family holiday or weekend escape will be absolutely memorable with Byron accommodation from AccorHotels.